While you may travel Ireland, theres no nicer person to meet than an Achill native. They are engaging, polite, and genuinely interested in others. Ask someone for directions and don’t be surprised if they offer to take you there themselves. If an Achill man or woman asks you if you are here on holidays, they will follow up with questions about how you are enjoying your experience. They want you to have the best time. They are proud to call this place home. More importantly, they want this to feel like home to you too. Ramble in for a pint of stout, as they say, talk with the locals. have the “craic” (a term used to express good times) You will learn more about the Island here than in any guide book. Irish craic really does exist and it’s a term that perfectly describes the Irish people, especially Achill. No one does this like they do. Yet it’s something that you have to experience. Why are the Achill people so engaging, friendly, and interested in other people, their culture, stories, and experiences? They get it. They understand what it means to come from a group of people that is connected to one another. They are proud of who they are and believe the people are their greatest asset. The Achill people are the most genuine and don’t take life too seriously. They understand that it’s the small things that matter. They aren’t concerned with popularity, fame, riches, or ego. What makes the Achill people so great? They understand that it’s people that matter. Achill has a scenery like no other. Sheer cliff faces that majestically rise out of the Atlantic Ocean, famed as the highest sea cliffs in Europe are only softened by the large tracts of blanket bog that sweeps from its highest points down to it's lowest at the sea shore. White-washed stone cottages nestled into foot hills and wrapped along stunning coastline. Homes that have served generations, give the Island its unique charm. 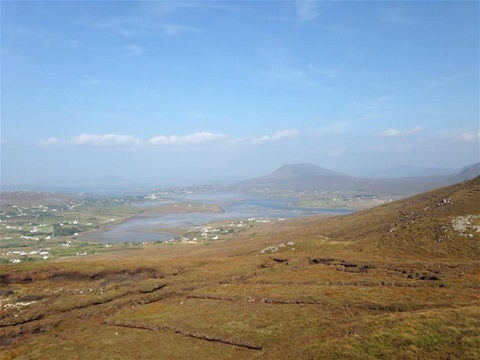 The best way to truly experience Achill is by foot or on a bicycle, cycle or hike along the hundred's of miles of bog roads that interconnect throughout the Island, hike the hills and discover hidden beaches, caves, castles, boley houses. Discover a time past. Achill boasts 5 Blue Flag beaches, the highest award that can be awarded for cleanliness and safeness by An Taisce. To put it into context, including Achill, Mayo has a total of 10. 5 beaches claiming the same high standard but each very unique with its own character. In no particular order. 1. The Silver Strand, Dugort. Also known as Pollawaddy this beach lies in the shadow of Slievemore Mountain, next to Dugort village. The smaller of the two beaches at Dugort, it is popular with local swimmers, especially for the ceremonial quick dip on New Year’s Day. There is a lifeguard in the summer. Grassy areas behind the beach provide shelter, and there is a parking area with picnic tables. 2. The Golden Strand, Dugort. About 3 km east of Dugort village is The Golden Strand, also known as Barnyagappul Strand, from the Irish for “gap of the horses.” This is the larger of the two beaches at Dugort and, like Silver Strand, has a lifeguard in the summer. Behind the pebble-strewn upper limit of the sandy beach, the dunes host a variety of native plants and wildlife. On a small coastal inlet, at Dooega village. The beach is on the Atlantic Drive, which overlooks the Atlantic Ocean along the southern edge of the Island. The landscape around the beach is a low lying flat coastal grassland of machair. Parking is available, and there is an access ramp, as well as life-saving equipment on the beach, but no lifeguard. Also known as Trawmore Strand, this beach is approximately 4 kilometres long. Views to the east of the Minaun Cliffs are spectacular. There is a lifeguard in the summer; swimming areas are clearly marked, to avoid strong undersea currents in places. The beach is very popular for watersports, and surfing instruction is readily available. One of the most famous beaches in Mayo if not Ireland. 10km west of Keel village, the road ends at the carpark in Keem (Kim), after a spectacular winding drive, overlooking the Atlantic. The beautiful horseshoe bay is overlooked by Croaghaun Mountain to the northeast and Moyteoge Head to the southwest a stepped valley rises behind the beach. Achill is a haven for a variety of water sports such as diving, surfing, windsurfing, sea kayaking and canoeing. With magnificent cliffs, excellent beaches and pristine waters, scuba diving around Achill affords the opportunity to explore a wealth of sea life in an unspoilt environment. The Atlantic waters off the Achill coastline are rich in marine biology and other historical features for the diver to explore. The wreck of the Aghia Eirini lies in 15 metres on a rocky bottom on the western shore of the island. This 4330 ton steamer ran aground and was wrecked on Dec 10th 1940 at Achill Head, close to a cove which is surrounded by high cliffs. The first deep-sea diver in Ireland, Jimmy O’Gorman, arrived in Achill shortly afterwards to help salvage the wreck of the Aghia Eirini and there began an interest in diving in the area, which is continued to this day by the Achill Dive Centre. Surfing is another major attraction with Keel strand being one of Ireland's most popular surfing destinations. Surfing tuition and surf board hire are available locally. Nearby Keel lake is popular with windsurfers, kitesurfers, canoeists and kayakers. The lake is easily accessible for cars, thus allowing watersports enthusiasts to convey their equipment right up to the lake edge. Kitesurfing lessons are available locally. Sea kayaking is also available from local outdoor activities schools and providers. Stand-Up Paddle boarding is one of the newest and fastest-growing watersports, which combines a surfboard and a long one-handed paddle. It is an excellent sport for surfers and non-surfers alike, which promotes balance, strength and general fitness. Keel lake is ideal for beginners to Stand-Up Paddle boarding, while the Atlantic waters around Achill are suitable for the more experienced SUP boarders. Courses and tuition in most of the above watersports are available seasonally on Achill and some courses are residential. 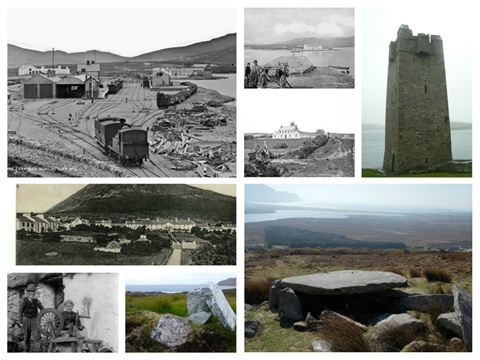 Achill has a history of human settlement that is at least 5,000 years old. The remains of megalithic tombs and monuments suggest settlement by Neolithic people in the 3rd or 4th centuries BC. These people significantly changed the landscape of the area, which at the time was heavily forested. Neolithic culture brought farming to Achill, requiring the clearing of forest for cereal crops, and walled fields for livestock. It is estimated that at the end of the Neolithic period, about 4,000BC, Achill had a population of 500-1,000 people. Evidence of Bronze Age (c. 2000BC) settlement on Achill includes hut platforms and associated field systems and enclosures in the area of Slievemore. The remains of several promontory forts along the coast show that settlement expanded across Achill Island in the Iron Age (c. 400BC). The early medieval period, dating from about 400 AD, saw great expansion in agriculture, in particular with the introduction of more iron tools, including the plough. 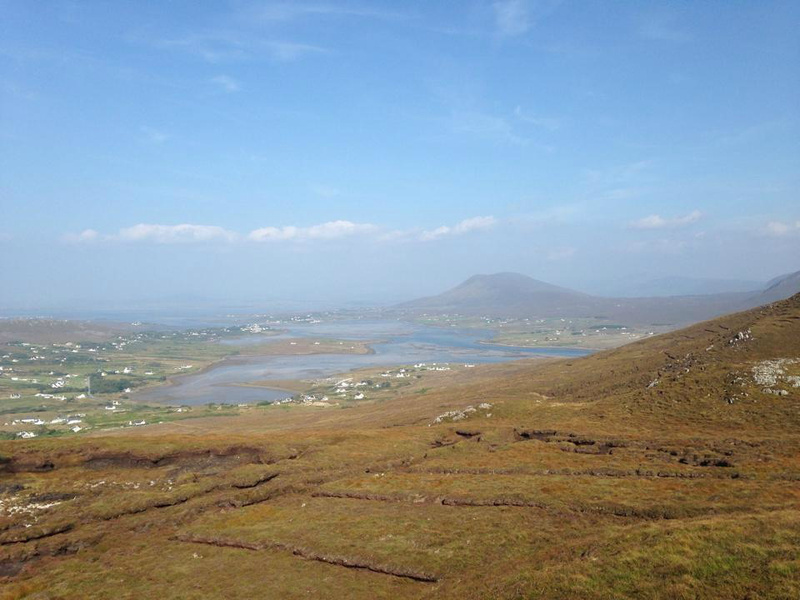 Evidence of early medieval artefacts have been reported at Keem Bay, Slievemore, Kildownet and Achill Beg island. The arrival of Christianity into Ireland at about this time is reflected in two remnants on Achill: at Kildownet the ancient church is named after St. Damhnait (St. Dympna), a 7th century saint, and at Slievemore there is an ancient church site and Holy Well, both dedicated to St. Colman, also a 7th century saint. Achill lay within the ancient Kingdom of Umaill which was ruled at various times by a small number of families or clans including the Butlers, the Burkes, the O’Connors, the O’Donnells and, probably most famously, the O’Malleys. The name O’Malley is still common in Achill today, and the original Clan O’Malley has had links to the area since at least the 12th century. The best known member of this family was Grainneuaile (Grace O’Malley), the legendary Pirate Queen who once owned Kildownet Castle. The O’Malleys controlled the waters of the western seaboard, imposing taxes and levies on all ships passing through this territory. In the 17th century the Cromwellian clearances from the lush farm land in the north and east of Ireland dispersed many native Irish families into the remote and harsh landscape of the west. It is thought that many Ulster families sought refuge in Achill, and the prevalance of Ulster surnames in modern Achill supports this. 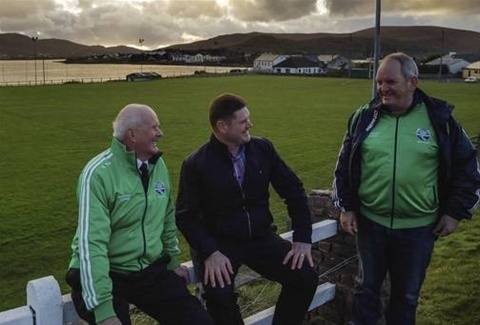 Names such as Gallagher, O’Donnell, Corrigan, Cafferkey and Mulloy are common in Achill but have their origins in Ulster. Between 1831 and 1834 a Protestant missionary settlement including schools, cottages, an orphanage, a small hospital, a hotel and a church was built at Dugort by Reverend Edward Nangle and can still be seen today. During the Great Famine of 1845 – 1849 there were many accusations of “taking the soup”. In 1848 there were more than 3,000 people working for the mission, clearing land, building roads and walls, etc. In July 1847 it was estimated that 5,000 of Achill’s total population of 7,000 were receiving daily relief from the mission. The mission fell into decline from the mid-1850s after Nangle left to become Rector of Skreen, County Sligo, and it was all but gone by 1883. Set at the foot of the south-facing slope of Slievemore mountain near Keel, the Deserted Village consisted of 137 buildings in 1837 (Kingston Bob, Achill Island: The Deserted village at Slievemore, 1990, p 75) the remains are still visible today. It is thought that the village was occupied during several different stages in history, with some of the buildings perhaps being constructed on top of previous houses. The most recent period of habitation came to an end in the early 20th century, when the cottages were used for ‘booleying’ by the local population. As ‘booley’ houses they were occupied during the summer months, when cattle would be grazed on the mountainside, but the residents would return to their homes in the villages of Pollagh and Dooagh for the winter months. 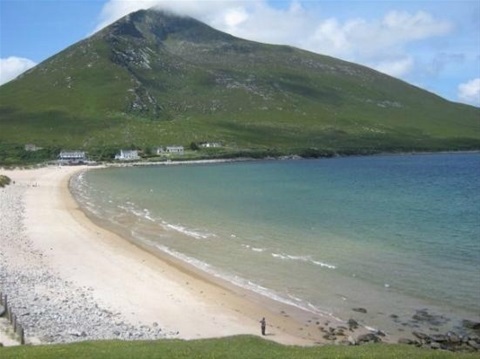 Achill is thought to be one of the last places in Europe to have practised this lifestyle. There are a number of other booley villages on the island, including one at Bunowna (in the valley at Keem Bay) and another at Annagh, but Slievemore is by far the largest and best preserved.